A wall of the Lumbridge Castle cellar has collapsed, and Sigmund, the king's adviser, suspects a monster attack is imminent. Can you find the real cause of the collapse before it's too late? Sigmund is the advisor to the Duke of Lumbridge, but the Duke does not always take his advice. When part of the cellar wall collapses, the Duke insists the damage was caused by an earthquake, but Sigmund is worried about a monster attack. If you investigate this mystery, it will lead you through treacherous caves to uncover something lost by the gods for thousands of years. 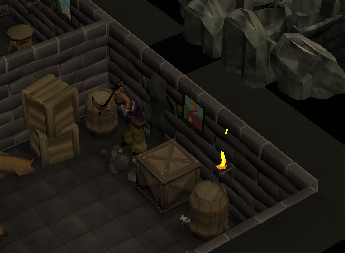 Begin by speaking to the new advisor named Sigmund in Lumbridge Castle. 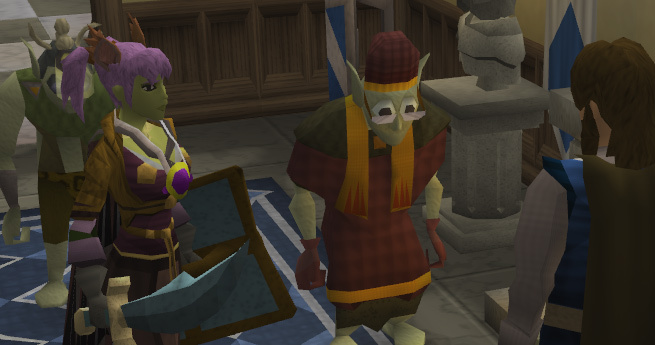 Firstly, start off by speaking to the new Lumbridge Castle advisor named Sigmund. After speaking to him, talk to either Hans, the Castle Cook, Bob the Axe Seller, or the Priest in the nearby Church. One of them will tell you that Goblins with big eyes have broken through a wall. Now speak to Duke Horacio and Sigmund again. Head down the ladder in the Castle Kitchen into the cellar, and then use your Pickaxe on the Rubble on the wall. You should find a small Brooch on the ground just beyond the Rubble; pick it up and look at it. Speak to both the Duke and the advisor and they will suggest that you speak to Reldo, the Librarian of Varrock. Reldo says that he isn't sure what it is, but he wrote a book about the different Goblin Tribes. Search the shelves on the west side of the library until you find a Goblin Symbol Book. Read it until you finally realize that it belongs to the Dorgeshuun Tribe. Keep the book for this quest, as you may like to use it to help you later on. Now go to the Goblin Village located north of Falador. Speak to both General Bentnose and Wartface about each of the options. You'll learn about the history of the Goblins, along with 2 new emotes: Goblin Dance and Goblin Bow! Head back to Lumbridge and speak to the Duke and Sigmund again and tell them what you've learned. Go back into the Goblin Caves below the castle and head down the path to the southwest. Continue east and follow the symbols in the book. According to the symbols written, if you read the book you can follow the directions that are given. Navigate with the symbols in the book or follow the below map until you come across a mine with a Goblin named Mistag and greet him with a Goblin Bow. He wants you to make peace with the Duke of Lumbridge. Talk to him again and he will show you the way out. Speak to the Duke again and he will tell you that his Silverware has been stolen. Now pickpocket Sigmund for a Key, unlock the Chest in the southern room and wear the H.A.M. Robes that you find. Go into the H.A.M. HQ which can now be found by pickpocketing the trapdoor east of the River Lum (near the cow pen) in Lumbridge. Picklock the Trapdoor climb down, and search the first crate for the Silverware. Speak to the Duke and advisor again, and Sigmund will be dismissed for committing treason and plotting war between the Humans and Goblins. You will receive a Peace Treaty Scroll; bring this to Mistag. When you get to the cave, a goblin named Kazgar can show you the way. Show the treaty to Mistag and you'll see a cut-scene of it. You'll also see Sigmund plotting behind the doors... Quest Complete! A Ring of Life Goblin Bow and Goblin Dance Emotes 3,000 Mining experience Freedom to use the Dorgeshuun Mines. Goblin Mining Helmet - trade the Brooch to Mistag for the helmet; you need 65 Firemaking to light it. 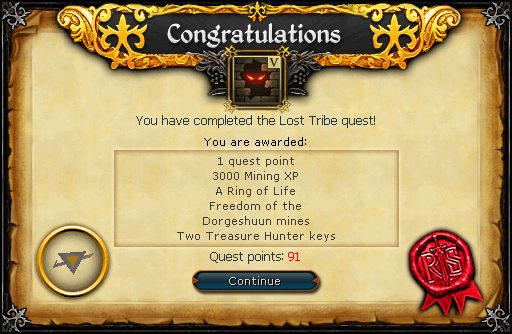 Ability to get Mining Helmets, Bone Spears and Clubs from the Goblin Guards and Miners. Mistag will now buy your Iron and Silver. 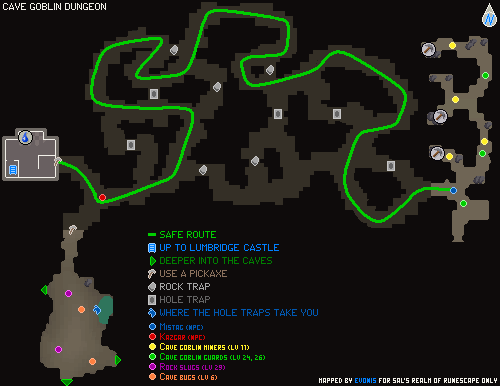 Shortcut to the Slayer Cave from Lumbridge Castle.